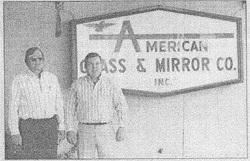 Nineteen years ago Larry Clanton started American Glass and Mirror Company with a borrowed truck, $20, and a lot of ambition. After only a few months in business Clanton recruited his brother-in-law at the time, Wayne Dawkins, to come join him in the venture. Dawkins, a native of Valdosta, had been working for a sprinkler company in Jacksonville, Florida and was looking to relocate back in his hometown. Clanton, after graduating from Lanier County High School in 1963 had gone to work for Georgia Plate Glass Company where he learned the glazing trade. Dawkins quickly learned the trade after relocating back to Valdosta. For a time the two partners were the only employees of the company. Operating out of Clanton’s home they worked long, exhausting hours servicing customers. “I know beyond a shadow of a doubt, without the Lord we’d never made it,” says Dawkins. Their philosophy – treating customers fairly – and their faith in Jesus helped get the business off and running. The owners incorporated in 1976. Clanton is now the president and Dawkins, secretary/treasurer. Despite both titles, both do hands on work from time to time. Next year, American Glass will celebrate their 40th year in business. The partners say their history has been both good and bad but they always count their blessings and rule out the tough times. “People used to laugh at us and say we would never make it. We didn’t have a lot of money but we had a lot of determination,” Clanton said. * Above adapted from article written in Valdosta Daily Times, Sunday, October 20, 1991. For more information about commercial glass and contract glazing take a look at our commercial glass page.